“The probability of global catastrophe is very high,” reads an excerpted statement from the Science and Security Board on the 2016 time of the Doomsday Clock. A suitcase nuclear device (suitcase nuke, suitcase bomb, backpack nuke, mini-nuke) is a tactical nuclear weapon which uses, or is portable enough that it could use, a suitcase as its delivery method. During the ‘Cold War’, both the United States and the Soviet Union have acknowledged producing nuclear weapons small enough to be carried in specially-designed backpacks. Many decades have since passed, and technology has advanced even further. Today, given the passage of time and modern advancements, one might speculate that others may also posses such capability – or have paid to obtain it. Lebed cannot be reached for further comment… He died not long afterwards when a Russian helicopter in which he was flying as a passenger… crashed. Stanislav Lunev. He defected to the U.S. in 1992 and has since worked as a consultant to the FBI and the CIA. Apparently he remains in the FBI’s Witness Protection Program. He also suggested that suitcase nukes might be already deployed on US soil and that “it is surprisingly easy to smuggle nuclear weapons into the US” across the Mexican border. The FBI claimed that he was ‘exaggerating’. Apparently the U.S. version of the ‘backpack’ nuke weighs 163 pounds. Reports vary regarding Russian ‘suitcase’ nukes weighing from 59 pounds to 154 pounds. There isn’t very much (in public) regarding the size and destructive power of these small nuclear weapons. The yield is hard to pin down. I have read that some may yield an equivalent of 1,000 tons of TNT while others several thousand tons… enough to level everything within a half mile radius and spread radioactive waste across a wide area. Note the bomb the U.S. dropped on Hiroshima was 15 kilotons. Have any of the bombs or materials thereof fallen into the hands of terrorists? ISIS? Iran? Has N.Korea, China, or any other nation developed a suitcase nuke for portability and apparent relative ease of detonation? The ‘Doomsday Clock’ now indicates three minutes to midnight and is the closest since the Cold War peak during the 1950s. Many believe that we will experience nuclear detonation in our lifetimes. In fact many believe we are on the precipice or even a false-flag nuclear event. Not likely to happen. IIRC, I have seen articles a few years ago where the suitcase nukes are a high maintenance item. If they are not maintained they will not work. Let’s hope so. I would say a chemical or bio threat is more likely.`But, I would rank suicide bombers above any NBC threat. With the dangers of radiation levels entering the west coast, dangers of Nuclear Power Plants failing and Nuclear bombs its time to add the wearable radiation warning patches and radiation meter to my prepping supplies. Ken can you recommend sources for these items? Thanks from me and all others for this info!!! I currently live within 65 mi of two Nuke Power Plants and because of refineries also in the area, this is a know target. I don’t trust being told everything is fine, I want to KNOW everything is fine. If I know something has happened I can take measures to minmize me exposure. Thanks again for the wake up call!!! No, not planning to BUG IN!!! Gunsamerica.com has many articles under prepping 101 in regards to Geiger Counters and the like. Mainly used by SF/SOG types for demolition of bridges/dams/choke points. Shielding for transport could pose a problem unless using vehicles/shipping containers. What did you mean by the term “SF/SOG types”, in your analysis of the article? Would you be specific. The US has no small tactical nukes. The inventory we had, about 100, was dismantled in the early 1990s. The Soviets had more, but no one knows how many or what exactly happened to them. They were under the KGB, and they kept more than one set of books. Who knows where they went. They take some work to maintain, but it’s possible some could remain operational. hope that 21Bravo is correct and they are nullified…but..
it still remains a concern..what about the individual components? Likely some nasty stuff there? any rate, Suitcase Bombs have been a topic of discussion / concern for more years than I can remember (with us). We do wonder where they are? etc…Doesn’t seem likely to be in a safe place. The Doomsday clock has been altered to include climate change, which gives a false narrative these days. Remember the climate change hoax agenda predicted Florida and New York City would be under 10 feet of water in 2016? I think if these suitcase bombs disappeared in 1997 they would be inoperable by now for it would take a terrorist scientist to maintain 100 bombs over all these years with access to all the equipment needed, or if terrorists had them, they would have been used 15 years ago instead of airliners to take down the World Trade Center. They may also have been used for a nuclear weapons program in these rogue countries such as North Korea, Pakistan, and Iran, for Russia has been developing these nuke programs for them over the decades. While it is still possible to make new ones and use them on us by evil powers such as Iran or North Korea, these bombs would assure mutual mass destruction if the right PTB are in control and intelligence can find the source. In any case, anything is possible these days with the lack of security at our borders and undocumented refugees. Because of this incompetency, there will be a time to pay the piper for the wrong decisions they make. A target of population would be too far away from me for radiation fallout which would be the biggest killer, and one of the many reasons I chose to live where I do. Preparedness starts with where you choose live to be safe from the biggest threats, natural, viral, or man made. 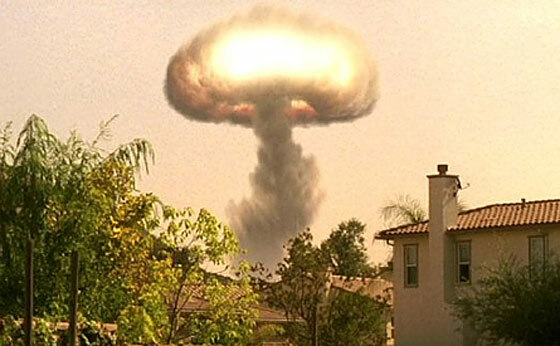 Suitcase nukes do not exist outside of hollywood fiction, but sadly we will see 6 of our cities nuked in the very near future.. I do know for a fact that about 40 years ago there existed M-10 (if memory serves) SADM in the US military. I cannot vouch for current inventory. The SADM- Sub Atomic Demolition munition (IIRC)- was a 3 piece bomb, used by a 3 man US SF’s team to plant near a Russian or East German airfields in case the Cold War went hot. The plunger was disguised as a tree stump…..
Can anyone comment on whether our interstate system has nuclear radiation sensors at the weight check stations? I know they’re at the major ports. SF had “suit case” nukes since the early 70’s. Usually it was a 3-5 man team that would slip in, meet, put the nuke together and leave. I suspect SF had teams working inside the U.S. during this time period as an additional duty and as a back up plan in case the soviets invaded. Their handlers would send each team member a Christmas card every year as a reminder that they’re still committed. Usually the card was addressed as “uncle Bob” or some type of fictional relative with no return address. In the late 70’s a good friend worked at a facility that made the Plutonium component for nuclear weapons. This took place in a medium size mid-western city 7 stories underground in an existing federal building that officially did not have seven stories of underground. I always thought it was odd to make these in a city but apparently Plutonium is much safer to be around than uranium is. They machined it on lathes and routers to exact shapes because their could be more easily pushed into a chain reaction this way. It allowed smaller weapons for MIRV missiles which were safer and used less components allowing more devices in a single rocket. These were small devices that could have been made into a backpack or suitcase nuke small in size and relatively light. Some years back, maybe 10 years or so, a high school kid did in fact design a small nuclear device using a piece of iron pipe a conventional explosive to trigger it and everything but the U-235 was available off the shelf. He was turned in by his high school science teacher to the FBI who briefly investigated him and confiscated all copies of his design. It was so small it could have been placed in a standard briefcase. The only problem with the design is that there wasn’t any shielding and U-235 will cause death with a few seconds exposure. You die weeks later but you die. So anyone making it or carrying it to the target is on a suicide mission. When the Soviet Union collapsed in the early 90’s supposedly 100 suitcase nukes went missing. Some believe that some Soviet generals buried them to prevent them from being stolen and sold into the black market. But no one knows for sure. Interesting posting. Add in that our favorite chubby whack-job now has some sort of fission nuke and Iranian missile tech and some psuedo-god-father/grandfather anniversary is up and coming…. Add in the other articles I came upon today that our border gates are thrown wide open by the administration…. Add too that our economy at best on a chart looks like the teeth on a 2-man bucksaw….. that we’ve one party fielding a publicly proud socialist and a woman under investigation for security violations…. another party with a self-aggrandizing bloviated petulant braggart reality show businessman running against a constitutionalist with questionable birth and not a chance in hell of winning halfway decent guy and a pro-amnesty in-the-pocket of establishment politicians ambitious liar………. And those are the good things!!! If they do have to nuke a city – let it be Chicago. We can do without that one. I have to disagree Heartless, if any city should be nuked, it should be Washington DC. Yeah, Peanut Gallery – you most likely are right. I just don’t like Chicago much. The whole damned state of Illinois with its unconstitutional gun-laws, over a century of corrupt politics; and well, I happen to be just barely old enough to remember a certain Mayor Daley and the 1968 Democratic convention when I but a sophomore boy in high school. Indelibly imprinted were the images of dogs being turned on the crowds, the beatings with billy-clubs and me asking my Dad – “What’s going on?”……… unbelieving that what I was seeing was America. Just a long held prejudice for that city is all. I truly think that is what was the spark that led me to this point in being on this side and preparations in general. My apologies – you’re right – Washington D.C., when Congress is in session, the Supremes seated at the bench deliberating about more planned-parenthood issues and a photo-op of the current first family underway on the White House lawn (ceptin’ the poor dog – I like dogs… a lot!!). Now…… if only we could have a tour by the top Democrat officials going on too led by Debbie Wasserman Schultz…….radio-active Nirvana. And no, I’m not angry or plotting/planning anything; just being delusional and dreaming of what’d make this country a better place. Only flaw – I’d hate to see the buildings taken out. Never seen them in reality. Always have wanted to. What’s the other kind of non-blast/short-lived rad-only nuke called? A ‘neutron’ one? Your reading to much in to it!!!! with nuclear miniturisation could fit in a slightly large briefcase. we must stop suitcase nuke from entering the united States.